With COM and .NET Component Services, skilled COM developers can leverage their knowledge for the next generation of components to be built for Microsoft's new .NET framework. A primary goal of Microsoft's COM+ is to provide proven design solutions for scalable systems. Assuming experience with classic COM, COM and .NET Component Services focuses on the added services of COM+, including support for transactions, queued components, events, concurrency management, and security. Along the way, it ably demonstrates that COM+ is a masterpiece of design and usability from the ground up--truly a mature set of component services oriented for the middle tier. COM+ provides a foundation for robust, enterprise-wide, mission-critical distributed applications. And it's not limited to Internet applications. You can use COM+ services in the same places as classic COM components: in-house two-tier information systems, client-tier controls, desktop applications, machine control components, and every other conceivable application of COM. 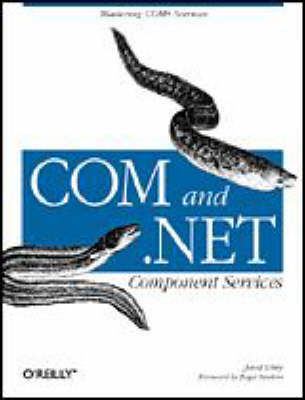 COM and .NET Component Services is the first book to stress the importance of learning to use COM+ services for both .NET and COM component-based applications. Since most companies have considerable investment in existing code base and development skills, COM+ can serve as a migration path for companies and developers. Companies can start (or continue) their projects in COM, using COM+ as a supporting platform for component services, and then when the time comes to move to .NET, they can start plugging .NET components seamlessly into the same architecture, reusing and interacting with their existing COM components.